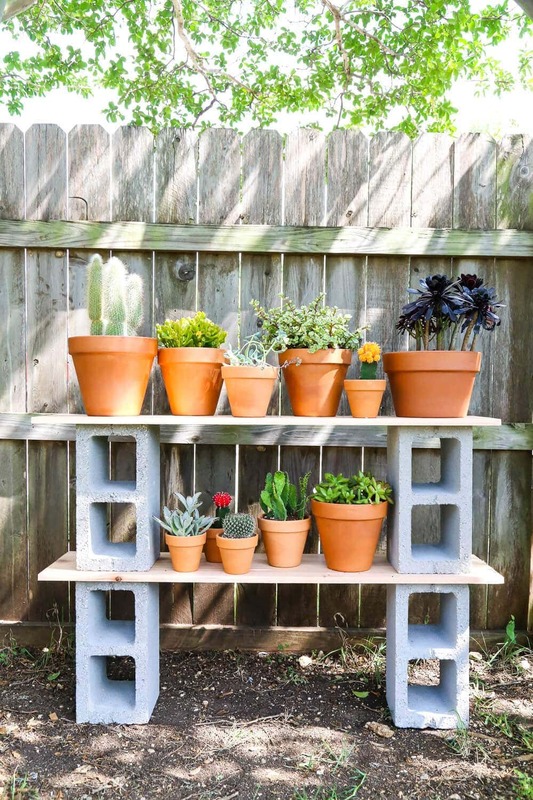 These simple cinder block shelves are so easy to make and are very affordable to boot. 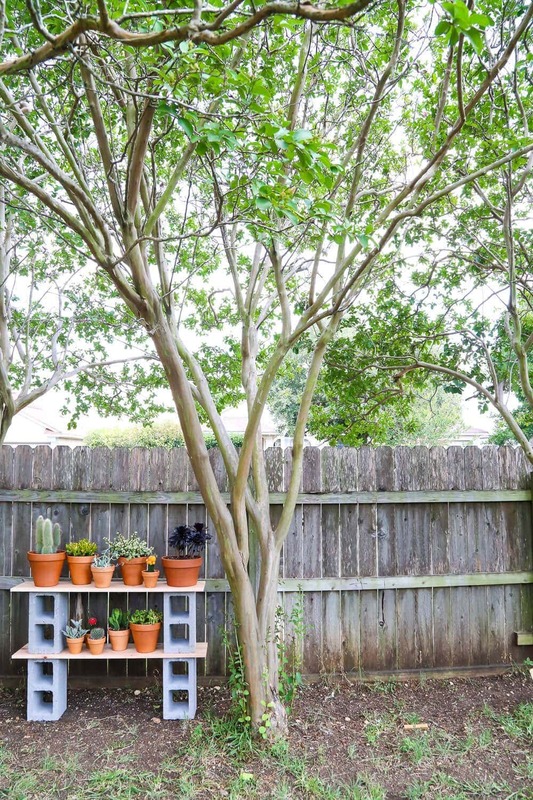 If you’re looking for an outdoor plant stand to display your plants, this is the perfect project for you! Every once in a while I do a project that’s so easy and so fast that I debate even sharing it over here. I mean, sometimes the tutorial is so quick that I wonder if it’s even worth it. Will y’all just roll your eyes and tell me you already knew that little trick? Will you think I’ve lost my mind? Well, this is one of those projects. 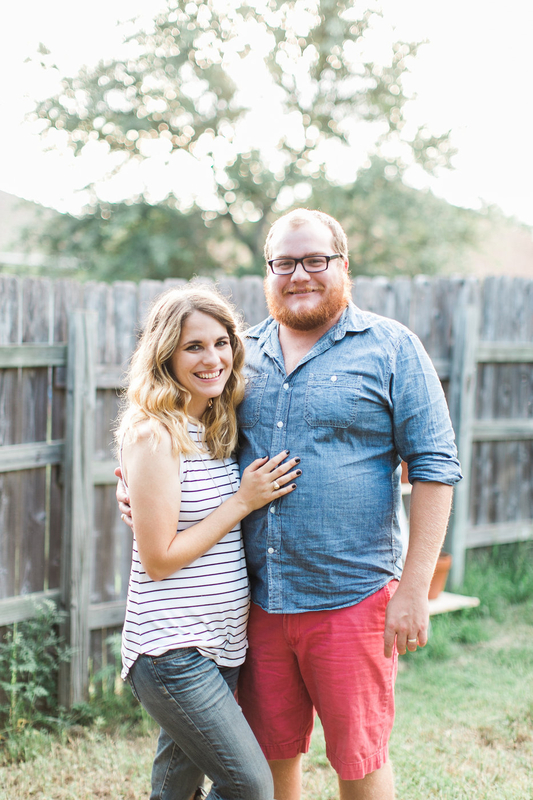 But seriously, even when it’s really simple, when it’s this dang cute I’ve just gotta share. So fun, right?! I made this little project for my demonstration at the Harvest event recently, and it was so much fun that I couldn’t resist coming back and sharing it with you guys. You ready to learn how to do it? 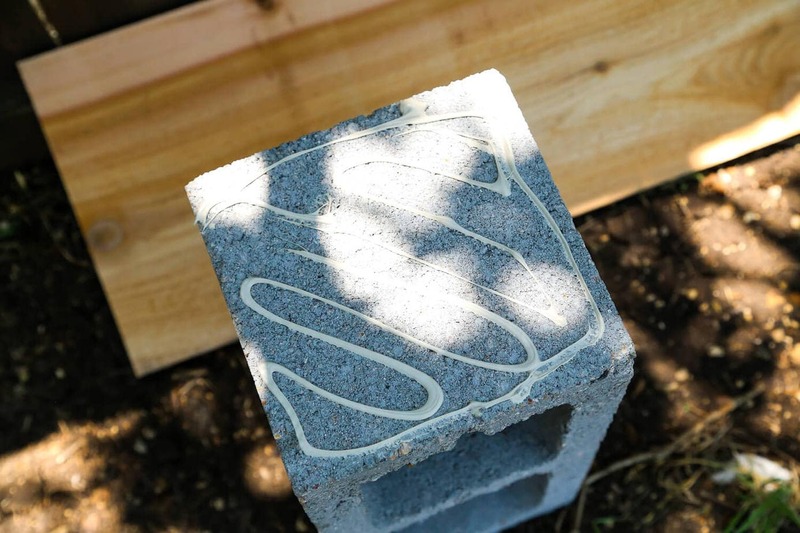 Start with two cinderblocks and set them upright about 3-feet apart (depending on how large you want your overhang to be). I used a level to help me make sure the boards weren’t offset at all and that they were both sitting straight. 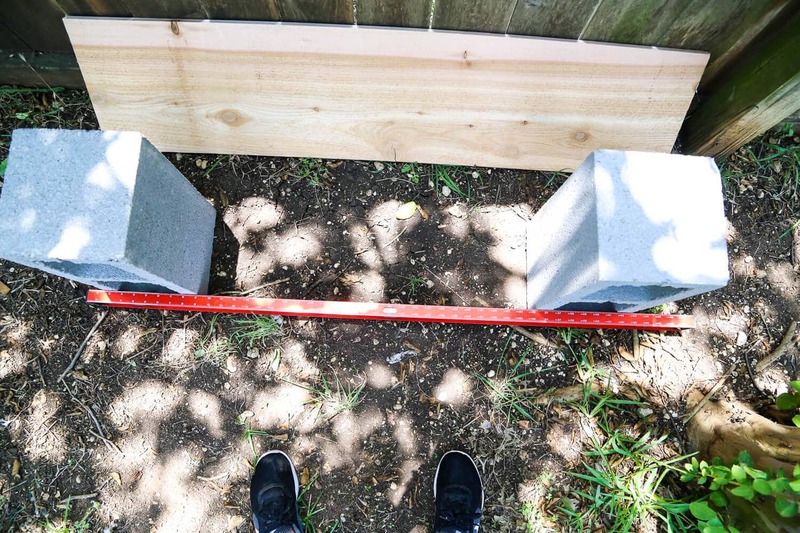 Cut your cedar board down into two 4-foot boards (I used my miter saw, learn how to use a miter saw here if you aren’t familiar with it) and lay it on top of the cinderblocks. 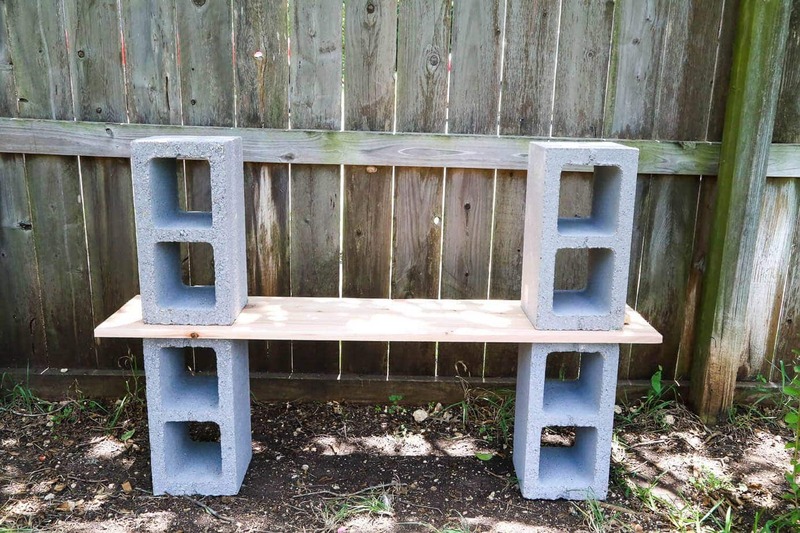 I used the other two cinderblocks as a weight on the first shelf for a couple of hours before adding anything else, just to make sure it was nice and set. 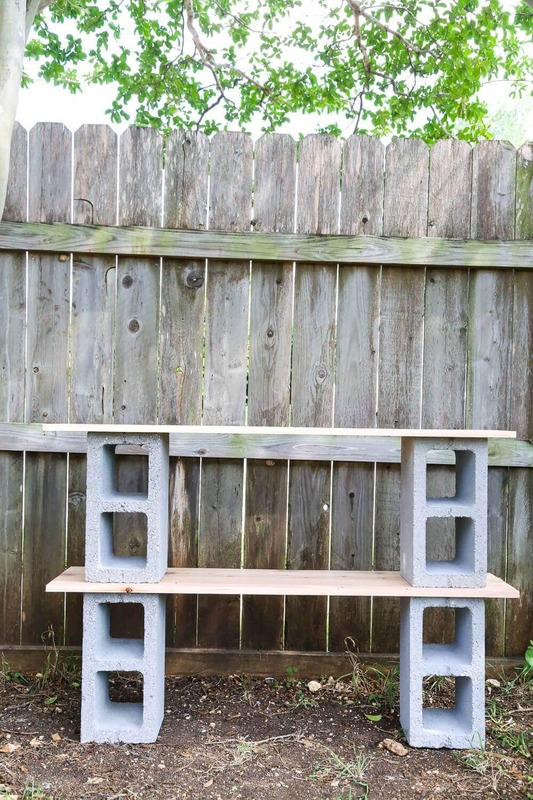 Once it’s dried, use some adhesive to add two more cinderblocks, and then the second shelf (again, I used a level here to make sure that everything stayed nice and straight, and I measured the overhangs to ensure that it stayed even on each side). Then, all that’s left to do is fill it up! I used the plants from our tiered ladder garden for these photos, but we’ll probably be doing something different long-term. I haven’t decided for sure what I want here, but right now I’m leaning towards having a little herb garden and setting it up with some supplies for trimming and watering the plants. 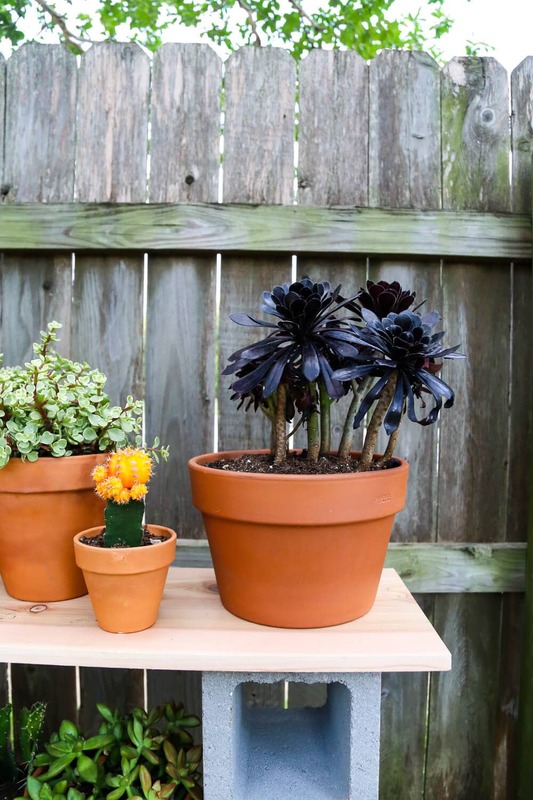 We’ll see what happens, though – I may go crazy and just buy a ton of pretty plants just because. 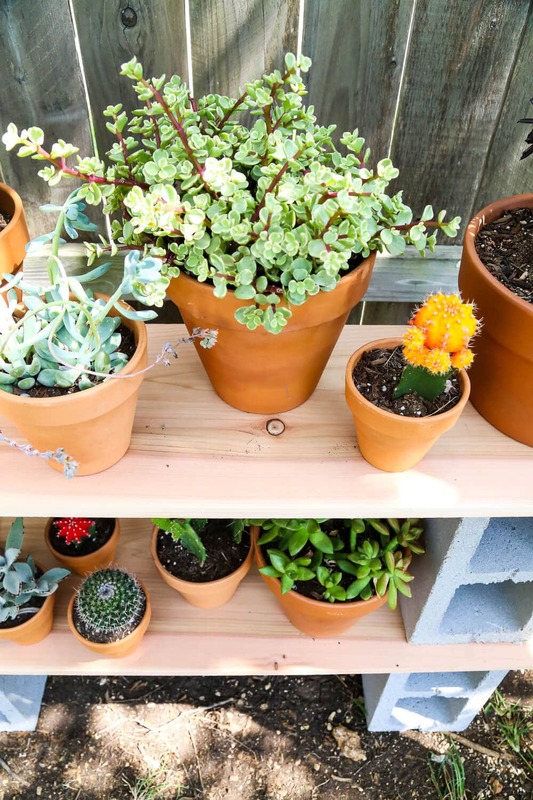 I love the look of the simple terra cotta pots with these shelves, but you could also do something a little more colorful. 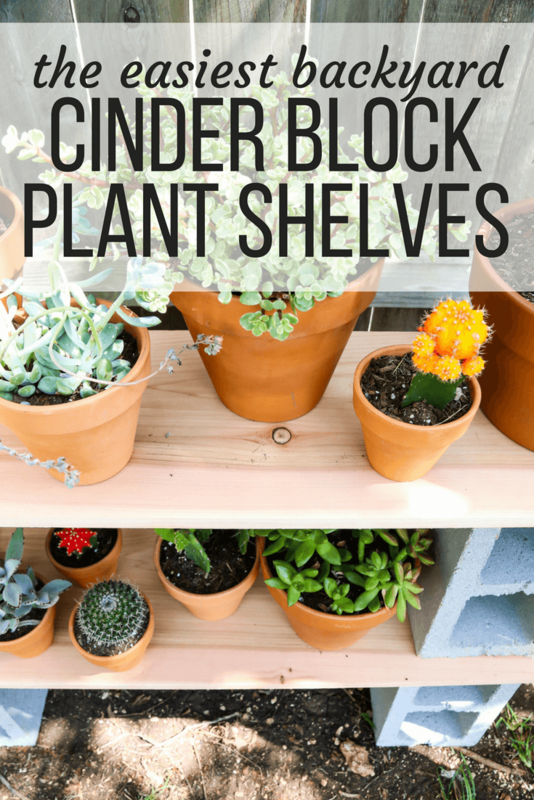 You could even paint the cinder blocks or stain the shelves. 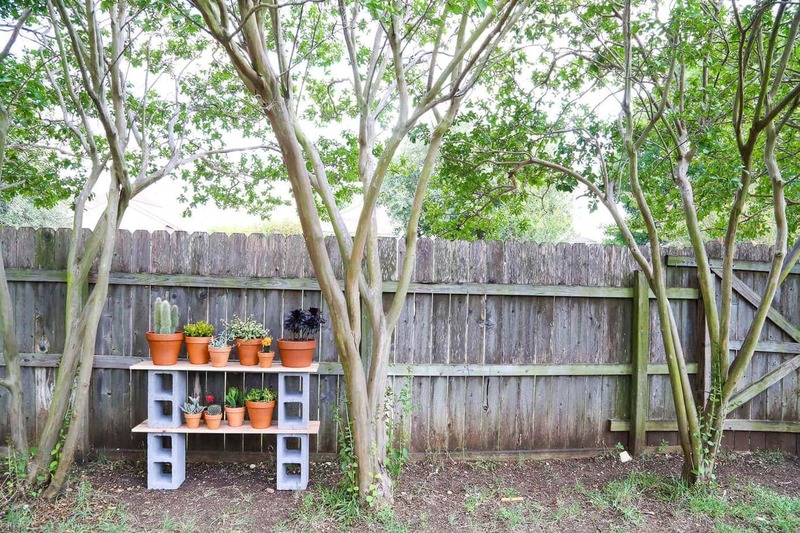 There are tons of options for how you make this look, but I was craving something simple and kind of rustic for my yard. I’d love to see a version with really bright blocks and colorful pots, though! 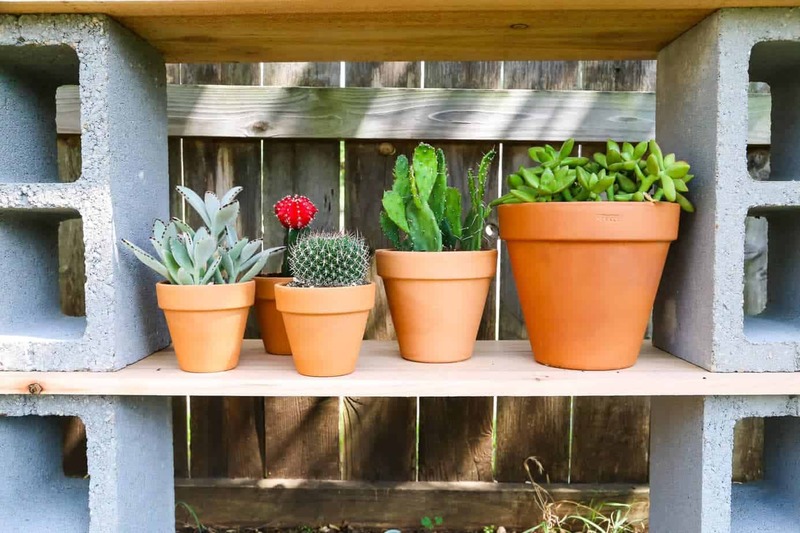 Of course, you don’t have to use this for just plants. 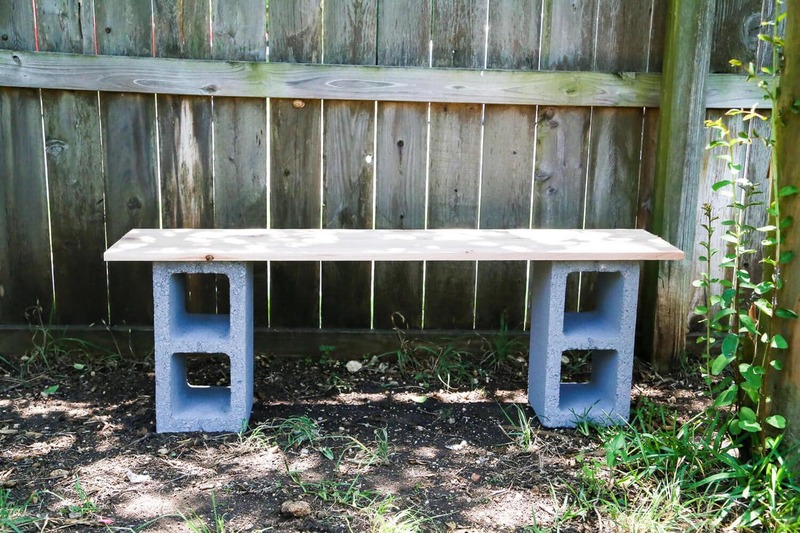 You could do a larger version and use it as an outdoor serving station or bar cart. 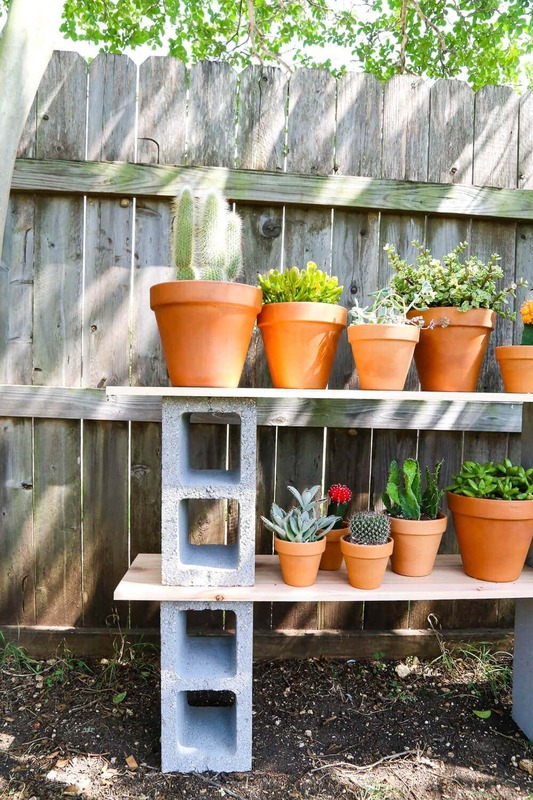 You could use it as a potting stand or a place to keep your kids’ toys – really, it would work for just about anything. But I’m a sucker for a good shelf full of plants. 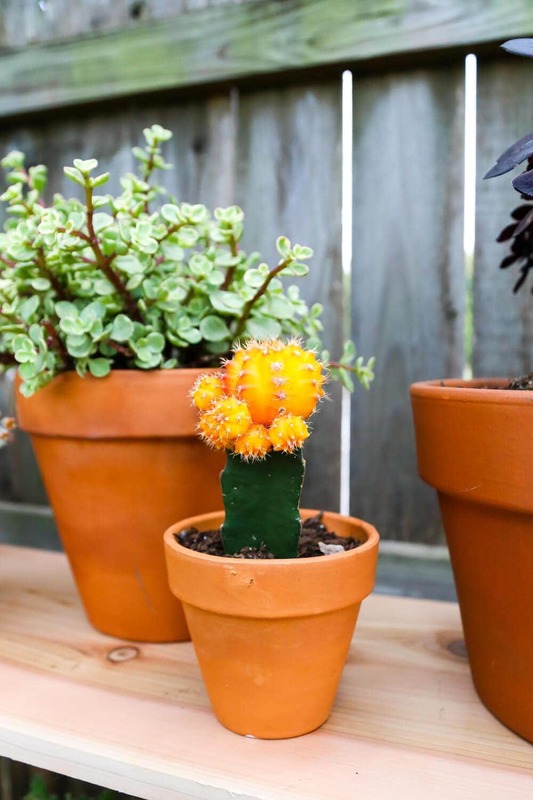 I’m pretty infatuated with how this little guy turned out – it was so easy to put together, and it’s such a fun way to display our plants in the backyard. I’ve learned that I’m not awesome with in-ground plants because they tend to just become a part of the background in my mind and I don’t remember to keep up with them. 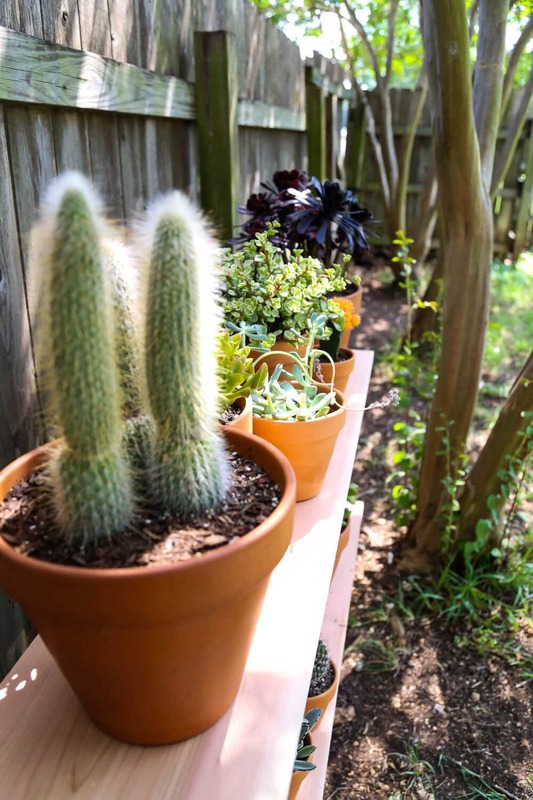 But potted plants seem to be easier for me to maintain, and I do a little better keeping them alive. For now. We’ll see what happens. What do you think we should fill our shelves with? Herbs? Do they do okay without full sun? Or just some flowers? Or maybe we could go crazy and try some container veggies? Ahh! I don’t know! I’d love to hear your thoughts. What should I do?